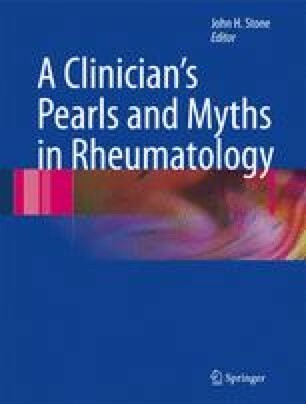 Rheumatoid arthritis (RA) is associated with vasculitis in approximately 1% of patients. Rheumatoid vasculitis (RV) refers specifically to a destructive inflammatory process with protean clinical features that center on the blood vessel wall. The disease strongly resembles polyarteritis nodosa in its predilection for particular organs: the skin, peripheral nerves, gastrointestinal tract, and heart. RV can affect a wide range of blood vessel types, from medium-sized muscular arteries to smaller arterioles even post-capillary venules (the size of blood vessels involved in many forms of small-vessel vasculitis). RV usually occurs in patients with severe, longstanding, nodular, destructive RA. Palpable purpura, cutaneous ulcers (particularly in the malleolar region), digital infarctions, and peripheral sensory neuropathy are common manifestations. Tissue biopsy establishes the diagnosis of RV. Deep skin biopsies from the border of ulcers may capture medium-sized vessels that are involved. Nerve conduction studies help identify involved nerves for biopsy. Muscle biopsies should be performed simultaneously with nerve biopsies to increase the diagnostic yield of the procedure.